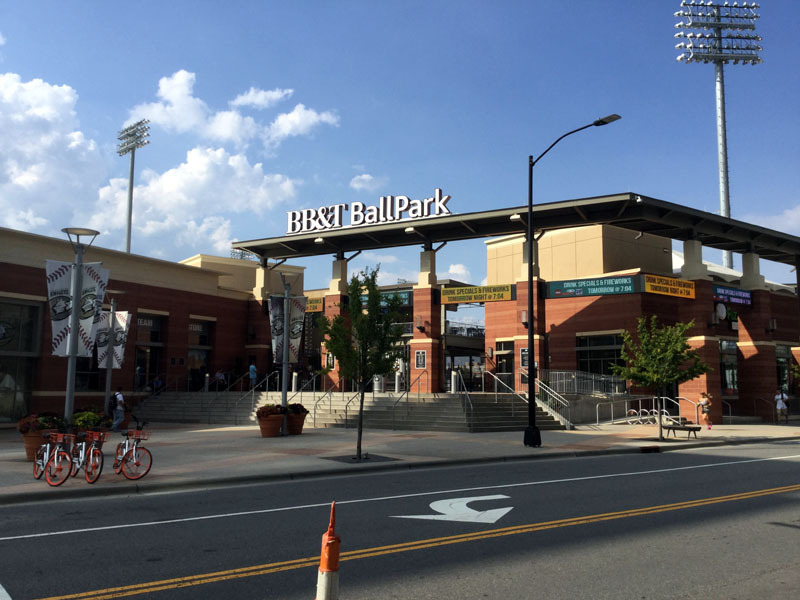 My third day in Charlotte included another evening Knights game at BB&T BallPark, but before I headed to the ballpark, I had another sports facility to visit. A day after using some spare time to visit the NASCAR Hall of Fame, I made the short walk over to Bank of America Stadium, home of the Carolina Panthers. 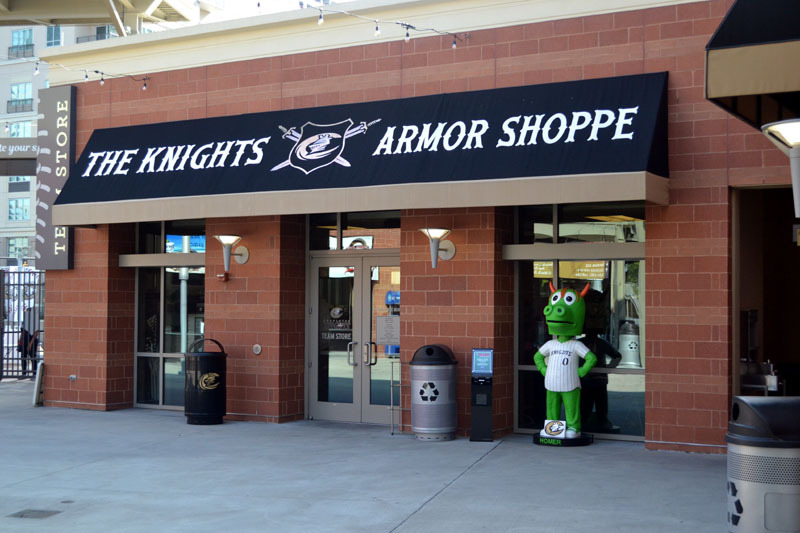 It’s only a block away from the ballpark, and offers daily tours. The tour that I took was only $6, and was very extensive — including a visit to field level, the visiting locker room, several luxury suites and more locations around the stadium. After the tour, I grabbed a sub on the short walk back to my hotel and took it up to my room to eat. 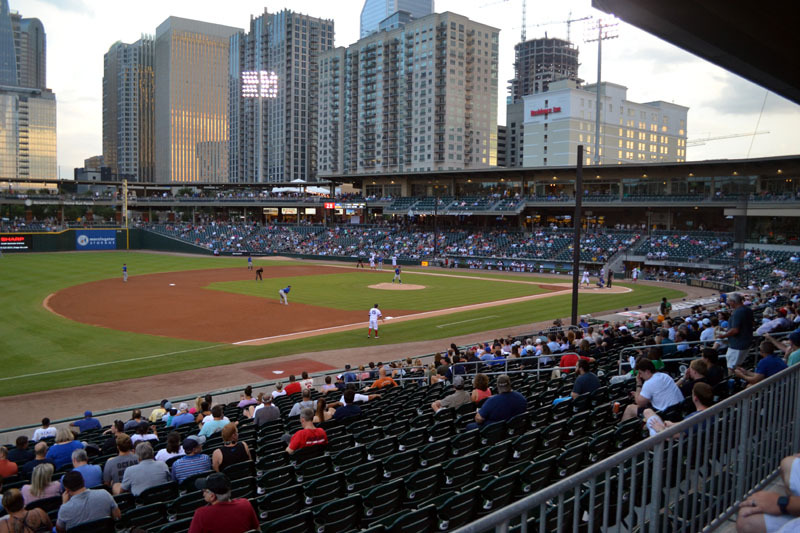 In my previous posts, I noted how conveniently located the Hilton Charlotte Center City was to not only the ballpark, but also to the other sports venues that I wanted to see. This is definitely the hotel that I recommend when you visit Charlotte on a baseball trip, and not only for its location. For more on the hotel, check out the bottom of this post. 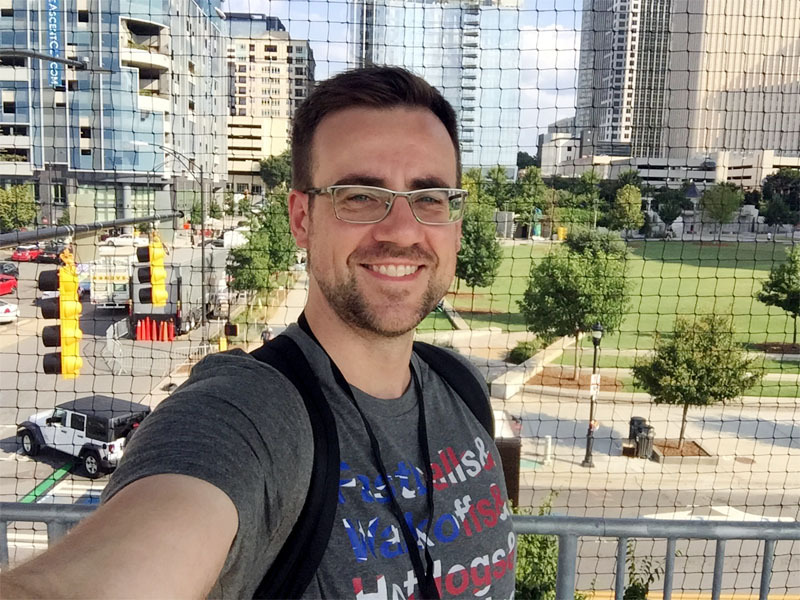 You can see a bit of Romare Bearden Park behind me and, of course, some of the city skyline that never gets old. You might’ve also noticed that I’m wearing one of my stars and stripes road trip T-shirts shirts — the first time I’d worn it, actually — which you can buy here if you’re interested. I didn’t do much walking around during BP. Instead, I mostly hung out in various spots behind home plate and just enjoyed the scene in front of me. Shortly before the gates were due to open, I made my way over to the area immediately inside of the main gates. 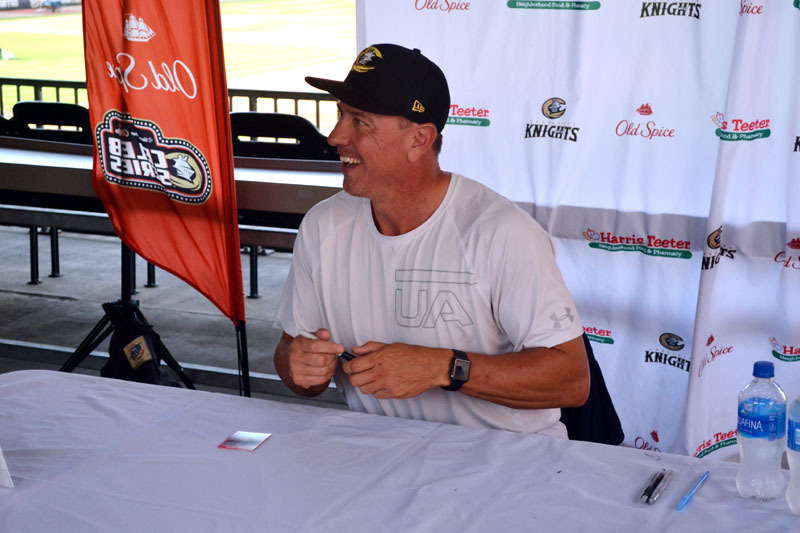 The Knights were welcoming longtime MLB pitcher Steve Avery for an autograph signing, and I wanted to see him up close for a few minutes. 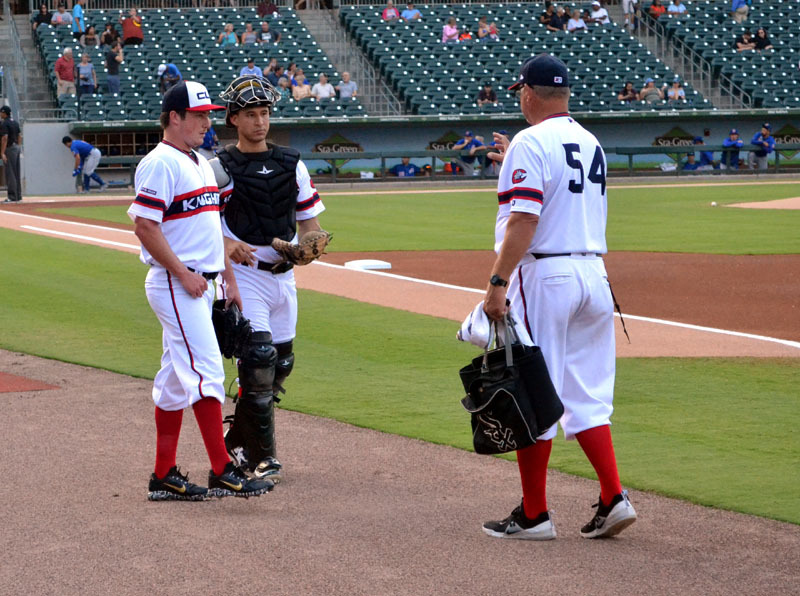 You probably know Avery’s name — he was a key member of the talented Atlanta Braves pitching staff of the early 1990s — and while he didn’t get the same acclaim as teammates Greg Maddux, John Smoltz and Tom Glavine, Avery ended up winning 96 ballgames in his career and was a part of Atlanta’s 1995 World Series-winning team. … and as soon as fans entered the stadium, they quickly lined up next to him. I’m not sure how long he spent signing, but it had to be at least half an hour, and I’m sure that a few hundred fans left BB&T BallPark that night as happy owners of Avery’s autograph. While Avery signed, and the grounds crew prepared the field after the completion of BP, I set off in search of something to eat. I always find that it can sometimes be difficult to choose my meal during my last visit to a ballpark. Even after visiting the previous two days, there were still a lot of menu items that sounded appealing — and that meant that the pressure was on to find something good. After excellent cheesesteak nachos during my first visit and an interesting but awkward hot dog on Day #2, I went in a different direction and bought a hamburger. This wasn’t any ol’ burger, though. It was called the Dragon’s Breath Burger (I’m assuming to pay homage to the enormous dragon near the batter’s eye) and it promised to be spicy. The spice came in the form of habanero pepper relish and jalapeno pimento cheese. 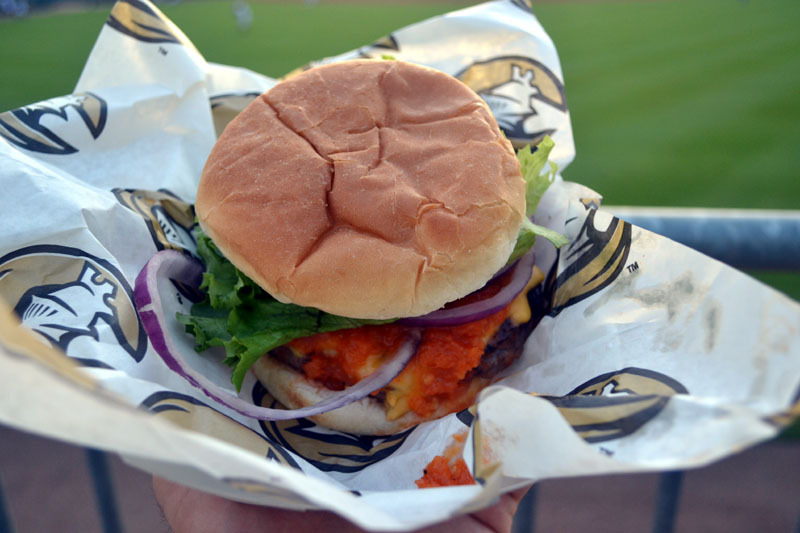 I decided to go grab a quiet seat in the outfield to tackle this burger, and I’m glad I did — it would’ve been awkward for any fans in busier sections of the ballpark to witness my tears. So, how hot is a habanero? I actually grow them in our garden, and know that a fraction of one pepper will nicely spice an entire pot of chili, for instance. It felt as though there was at least one full pepper on this burger, which put it well past the point of being “nicely spiced.” In terms of metrics, a jalapeno pepper can register as high as 10,000 units on the Scoville scale, but a habanero can get as high as 350,000 units. It’s about as hot a hot pepper you can find before you get into the “ridiculous” range with ghost peppers, Carolina reapers, etc. All of this meant that even a valiant effort from me wasn’t enough to finish this burger. After just a couple of bites, I was sweating, hiccuping, my eyes were watering and my nose was running. I regretted not being able to finish the burger, but each bite was agony. I generally like spicy foods, but this meal was just too much for me. For the rest of the game, I spent time in a bunch of places — an inning in the outfield, an inning on the home run porch, an inning on the grass berm, and so on — and, of course, I closed out the game by hanging out on the third base side of home plate where I could take in the view as the evening turned to night, wrapping up three outstanding days in Charlotte. The room was absolutely perfect. A really comfortable bed, free Wi-Fi that was really fast, free bottled water, a mini fridge and more, with everything spotlessly clean, were all things that I appreciated about my room at the Hilton. Every day of my trip was long and full, so it was always nice to have a comfortable hotel room with all the amenities I’d ever need to return to each night. 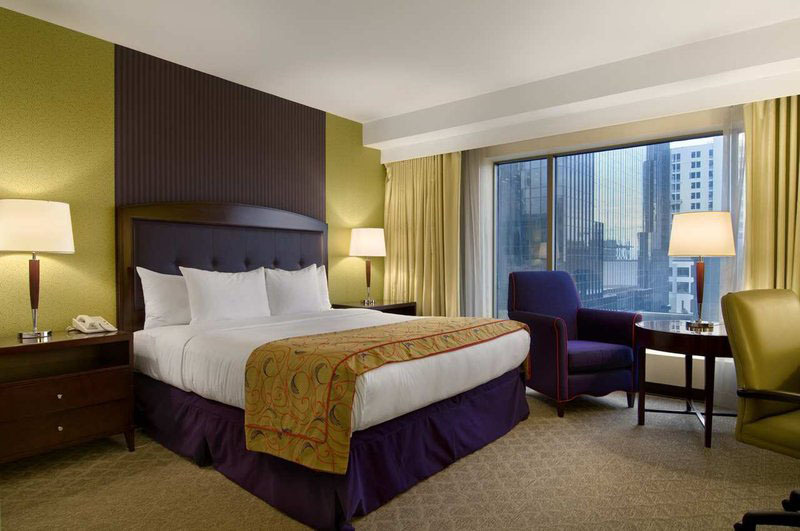 It will definitely be the hotel I choose whenever I get back to Charlotte. The end of my visit to Charlotte wasn’t the end of this trip, fortunately. About 12 hours after leaving BB&T BallPark, I’d be waiting in line at Charlotte Douglas International Airport to catch a flight to my next destination. Do the Knights still have the Knightingals cheerleaders at the games? That doesn’t ring a bell. I think there was some sort of spirit squad or whatever, but I don’t recall cheerleaders.